There is nothing half-made about The Half-Made World . 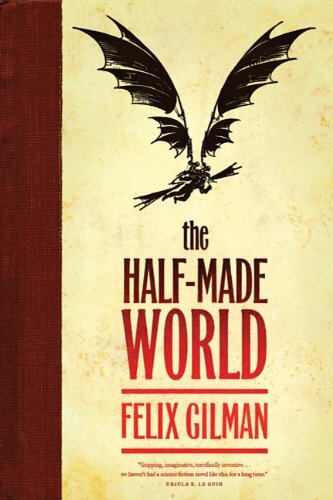 In fact, the irony of bestowing such a title on a novel whose setting is as thought-out, as detailed, and as richly realized as the world in which Felix Gilman's third novel takes place is so glaring that one can't help but suspect Gilman of making a joke. Such suspicions afflict the novel, and the experience of reading it. There is one reading of The Half-Made World in which it is a 500 page exercise in worldbuilding, whose author might get around to writing a story in its sequel. There is another reading in which Gilman's resistance to story, his deliberate evasion of it even as he builds the novel's world brick by brick, paragraph by paragraph, has a point, a goal, to it. Charity, and admiration of Gilman's previous work, incline me to the second of these two readings, but I'm not certain that that purpose justifies the work—on the part of the author or his readers—that go into it. The Half-Made World is set in a locale that I have seen described as Weird West, and which might be thought of as the American response to steampunk's fascination with the Victorian era. If there has been an entry in this burgeoning subgenre that is as comprehensive, as fully realized, and most of all as divorced from our world and our history of Western expansion (while still paralleling and recalling both) as Gilman's is, however, I’m not aware of it. The Half-Made World 's world is familiar and at the same time entirely foreign. There is a civilized and mostly peaceful East. There is a wild and mostly lawless West. There are strained, equally envious and uncomprehending, relations between them. There are native people being driven cruelly before the encroachment of so-called civilization. All of these are present in The Half-Made World , but they are all different: sometimes simply renamed, as in the Smiler religion that replaces Christianity, and sometimes remade into literalized metaphors. It is humans, and their settled presence, that make the world solid and rational in The Half-Made World , and the further one travels away from those established settlements, into the West where humanity has only begun to make its presence felt, the less solid the ground between one's feet becomes, the less binding the laws of physics and causality. The world becomes malleable, half-made, governed less by science and rationality and more by magic, until one reaches the Western Sea, where "Sea, sky, land, day, night, [are] indistinguishable, not yet separated. Where creation begins, or maybe hasn't happened yet" (p. 329). Making the journey from East to West, from civilization to irrationality, is Dr. Lysvet "Liv" Alverhuysen, a psychiatrist from the prestigious Koenigswald Academy who has accepted an invitation from the House Dolorous, a frontier hospital, to study and hopefully help its patients. Liv's outsider status and her long, arduous journey give Gilman the opportunity to construct the first half of The Half-Made World as a travelogue, and exposit about the forces whose struggle to define the as-yet unmade West forms the crux of the novel—the Line and the Gun. Line and Gun represent industry and lawlessness, two forces that shaped the American West. In the context of the novel they are given lives and minds of their own which eventually overpower the humanity that, in our world, brought these forces into being. A third force, democracy and the rule of law, is represented in the first two thirds of the novel by a book given to Liv before her departure (from which the description given above of the Line and Gun's emergence is paraphrased), A Child's History of the West by General Olran Enver, "First Soldier of the Red Valley Republic" (p. 29), which was "constructed in accordance with the best possible theories of political virtue" (p. 10), but which fell to the Line several decades before The Half-Made World ’s beginning. The republic is represented by its absence, and the reminiscences of it that Liv encounters announce their untrustworthiness through Enver’s true-believer demagoguery and through the History ’s having been targeted at a young audience. This oblique, sideways approach to what will eventually become one of the major forces in the novel is reflected in Gilman's construction of the Gun and the Line. Though Liv acts as our tour guide, she is at various points too preoccupied, too self-absorbed, or too naive to give us a broad enough view of either of these powers. When she does strain her attention, what she sees is often beyond her comprehension. Paralleling Liv’s journey towards the House Dolorous are Sub-Invigilator (Third) Lowry, an officer of the Line's forces, and John Creedmoor, an Agent of the Gun, who has been granted longevity and near-invulnerability in exchange for his services (and, it is strongly implied, his soul). Both are trying to get their hands on one of the House's patients, who lands in Liv's care and who, she eventually discovers, is General Enver himself. Enver’s mind was shattered more than a decade ago by one of the Line's weapons, but both the Line and the Gun believe that it still contains the secret he was seeking at the time of his final defeat—a weapon of the magical beings called the Folk, who populated the world before humans drove them off their lands and enslaved them, that might destroy the spirits animating the Engines and the Guns. Both sides want to deploy the weapon themselves, and to keep it out of the other's hands. To describe The Half-Made World thus is to create expectations of action, adventure, and most of all of a clear direction to the novel, leading away from the chaos and suffering caused by the Gun and Line's war and towards a future free of them both. Though Liv remains unaware of the story she is both living through and enabling until very late in the story—though her ignorance is in fact one of the novel's driving forces, as when she carries a Line tracking device for most of the novel's chapters—the readers themselves are informed of it within a few chapters of The Half-Made World 's beginning. Gilman's choice to create the expectation of this story and then defer launching into it—to get bogged down in Liv's journey towards the House Dolorous, or her experiences with the other doctors and patients she finds there, or her and Lowry and Creedmoor's reminiscences of their pasts—can thus only be read as an entirely deliberate one. This reading seems confirmed by the final third of the novel, in which Liv and General Enver are kidnapped by Creedmoor, who tries to shake off Lowry’s pursuit by taking them into the unmade lands. There he and Liv find themselves again and again on the brink of learning the General's secret, and that of the Folk's master plan, only to be confounded by interruptions and happenstance. If it is a deliberate choice—and The Half-Made World is too skillfully constructed, too well-realized, too carefully and attentively written, for it to be anything else—then what is its purpose? What is Gilman trying to accomplish by constantly weaseling out of the very plot he has worked so hard to suggest? The answer can only be the half-made world itself, into whose description the bulk of the novel's energies seem to have been diverted. The Half-Made World is the story of systems, and of the individuals who shape and are shaped by them. Liv, Creedmoor, Lowry, and the survivors of the Red Valley Republic whom Liv and Creedmoor encounter in the unmade lands are all products of the systems they were born to (or, in Creedmoor's case, adopted; when his backstory is revealed we discover that Creedmoor experimented with several creeds and philosophies before plumping for the Gun’s nihilism). In order to live within these systems they have each been forced to give up a part of themselves—Liv's sense of adventure, Creedmoor's conscience, Lowry's pride and free will, the Republicans' sense of self-preservation (even as she warns them that the Line is following her to their doorstep, Liv thinks that "they did not really imagine that they would ever be reinserted rudely into the violence of time, that their precious perfect children would ever be scarred for the cause as their fathers and mothers were" (p. 389)). It is no coincidence that both the novel and the characters come alive after Liv and Creedmoor escape to the unmade lands. Unburdened of the stuff of civilization—and of Gilman's worldbuilding—the characters can breathe freely, be themselves first, and representatives of a system second (if at all) for probably the very first time in their lives. At the same time, The Half-Made World repeatedly challenges its own cosmology, in which individual humans are at the mercy of supernatural forces, by subtly suggesting that those forces, and the systems through which they are expressed, are human creations. One of Liv's colleagues at Koenigswald Academy has constructed "a system of psychology that divided the mind into contending forces of thesis and antithesis, from the struggle of which a peaceful synthesis was derived," which Liv finds "mechanical and unrealistic" (p. 21). At the House Dolorous she encounters a patient whose "one peculiarity was that he was quite convinced that the world as it appeared was all in his own mind, and in particular that the warring forces of Line and Gun that crashed back and forth across it were merely the opposing forces of his own diseased will" (p. 166). On her way to the House she encounters Smiler philosophy for the first time: " The world is what we make it. The notion was at once intimidating and encouraging" (p. 68). Meanwhile Creedmoor, the one character most closely in contact with supernatural forces—he spends the novel in conversation with Marmion, the spirit who animates his Gun—insists that all of the magical forces in the novel—the Gun, the Line, the spirit that protects the House Dolorous and heals its patients, the monster who dogs to Red Valley Republic town in the unmade lands—are manifestations of primal human emotions such as anger, misery, or fear. Humans both make are made by their systems. The world makes us who we are, but it is also what we make of it. If there is a single flaw in this conclusion—or, more precisely, in the way that this conclusion reflects back on the reality to which the half-made world acts as a mirror—it is the role that Gilman gives to his Native American analogues, the Folk, who in the novel exist outside of human systems because they are not human. Instead, they are immortal, elf-like creatures who represent the irrational magic that humanity's presence solidifies and eventually drives away, who "do things that don't make sense" (p. 82). This is troubling when the Folk are first introduced and their inhumanity is made apparent. It becomes more so as the novel's scheme is revealed, and as that scheme appears to fall in line with the by-now exploded conventional wisdom that Native Americans and other tribal people exist outside of human civilization, rather than representing a more basic, or perhaps simply different, version of it. As the Folk are ultimately revealed to have been, however haphazardly, driving much of the novel’s plot, it is possible that its contention that they exist outside of systems of civilization is meant as a reflection of Liv, Creedmoor, and Lowry’s blinkered perspective, and that the continuation of The Half-Made World ’s story will reveal that they too organize their society according to certain principles. In this volume, however, the absence of such a principle grates. That objection momentarily laid aside, the argument that civilization is both the cause and the effect of human consciousness has the ring of obvious truth to it, and in that obviousness lies the novel’s central problem. This is a thin and diffuse conclusion on which to hang a novel as bulky and overstuffed as The Half-Made World . For Gilman to take us and his characters on such a long and meandering journey, repeatedly frustrating our and their expectations of a story, in order to arrive at a moral so obvious—and moreover, to conceal that moral so thoroughly, burying it under so much detail, so that the novel has to be chewed over and contemplated thoroughly before it emerges—seems wasteful. This is not to say that the journey isn't worth taking in its own right. If nothing else, The Half-Made World is worth reading for the half-made world, for the details of the fine universities, ramshackle towns, terrifying Line stations, and seedy bars in which it takes place. Gilman's hand is sure on the descriptive tiller, equally comfortable describing the familiar, the fantastic, or, in the unmade lands, the surreal. The characters also make the ride worth taking. Liv is brittle and blinded by self-importance—in theory, the last person you'd want showing you their world, but in reality an essential point of calm and stability at the center of the novel's increasingly tumultuous events. Even as it is leavened by wisdom and a greater understanding of her world's history, her self-absorption is both the cause of her survival and salvation and our rallying point. Creedmoor is alternately heroic and pathetic, as he contemplates leaving the Gun's service but always goes back, his attachment part slavery, part addiction. As Lowry puts it, "he [demands] to be admired both for his loyalty and for his disloyalty [to the Guns], and for his oh-so-tortured indecision between the two" (p. 304). Lowry, meanwhile, is a magnificent villain. Like Creedmoor, he struggles against his masters, trying and repeatedly failing to efface himself in their service, to erase his pride and desire for recognition. Once he crosses into the unmade lands and away from direct contact with the Engines Lowry's own character begins to emerge, and it become clear that what the Engines were suppressing was a cruel, malicious creature whose pursuit of Creedmoor and Liv, even as it costs the lives of nearly all his men, is terrifyingly single-minded. But though it is tempting to read The Half-Made World as either a character piece or an exercise in worldbuilding, it is clearly not these things. Despite, or perhaps because, of its repeated frustration, the novel’s plot is too insistent to allow us to simply revel in Gilman’s construction of world or characters. When we turn the last page, therefore, with Liv and Creedmoor almost as the Western Sea, after all their strenuous journeying, after Lowry's relentless pursuit, after the General's suffering and the repeated frustration of the Folk's plans, the question that most clearly suggests itself is "is that all there is?" It is the answer to that question that will determine The Half-Made World 's meaning and its ultimate value. The novel’s ending, which finds Liv and Creedmoor in possession of the General's secret and free, for the moment, of the Line and the Gun's pursuit, would seem to suggest a sequel, which Gilman is reportedly working on (though the final chapters’ tone indicates finality, and Liv and Creedmoor are at best ambivalent about the opportunity they now have to change the world single-handedly). But what form will this sequel take? Will it continue The Half-Made World 's indecisiveness, or abandon it, following Liv and Creedmoor as they remake the world? Either of these choices would recast the first volume, make it something entirely different. I find myself, therefore, unable to perform the reviewer's basic function, and give this novel my positive or negative reaction. I suspect that I won't be able to come to that conclusion before reading the sequel. Like the in-flux ground beneath its characters’ feet, my opinion of The Half-Made World remains half-made. I came to much the same conclusion, but I have to admit that I am not sure that any of it is entirely intentional. Gilman is wonderful at the small scale, but I fear that the architectonics get away from him, sometimes. While I agree with the reviewer that the overarching plot is not especially clear or linear, and that the ending is an anti-climax, I don't think that the claim that descriptive virtuosity is the reason to read the book is justified. First, because even though the macro-plot is kind of simple and a bit unclear at the same time, there is a genuine sense of tension throughout the book. Second, "description", Zola-style, is not what Gilman does. His world-making is layered and comes from demonstration rather than exposition. And drawing on the tropes of the wild west means that he doesn't have to do a lot of work with the basics, which come very easily to the reader even though they are unstated. For me one of the best exercises in the book was trying to figure out what the various forces were representing. The Native American/African American Folk are undeveloped, but maybe in book two this will change.